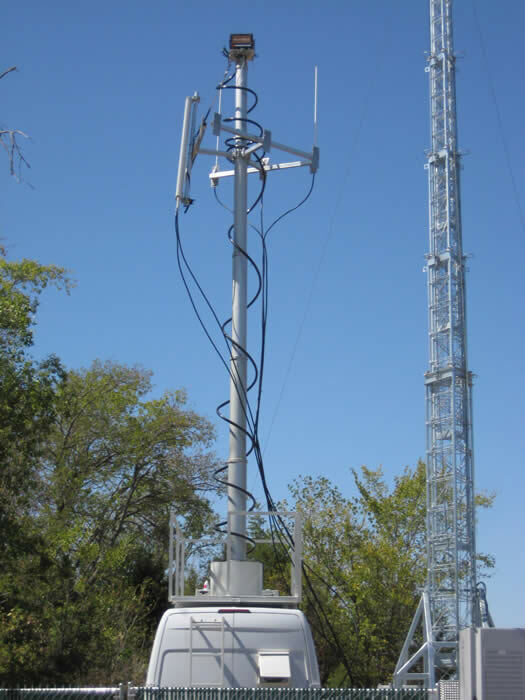 We also offer modifications to cargo vans called our CSVAN (Cell Site on Van) product for installation of Will-Burt pneumatic masts, for both cellular, broadband and broadcast applications. 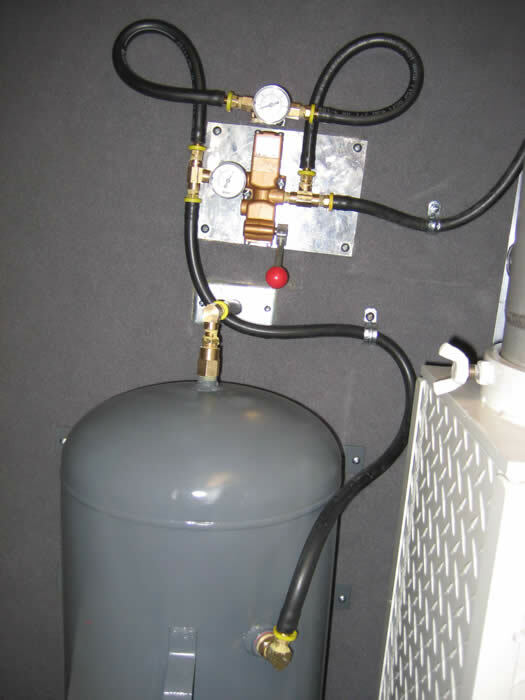 For the cargo vans, we can install the masts (1 or 2) through the roof and onto the cargo floor; install the (1) air conditioner, electrical panels / lights / outlets, required racks into the main compartment which is insulated; then install the generator, fuel tank and air compressor into the separate rear compartment, and make any other mechanical and electrical modifications that are required inside the van, including any conversion required for the application, such as work stations, etc. 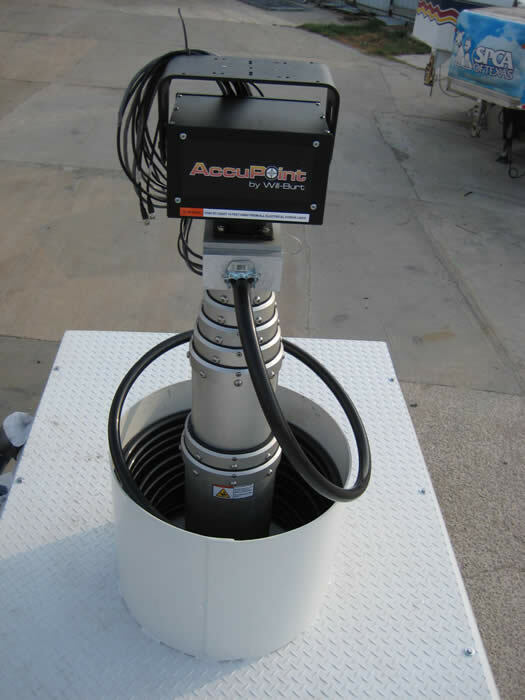 For all of these applications, we can offer either Will-Burt locking or non-locking pneumatic masts. 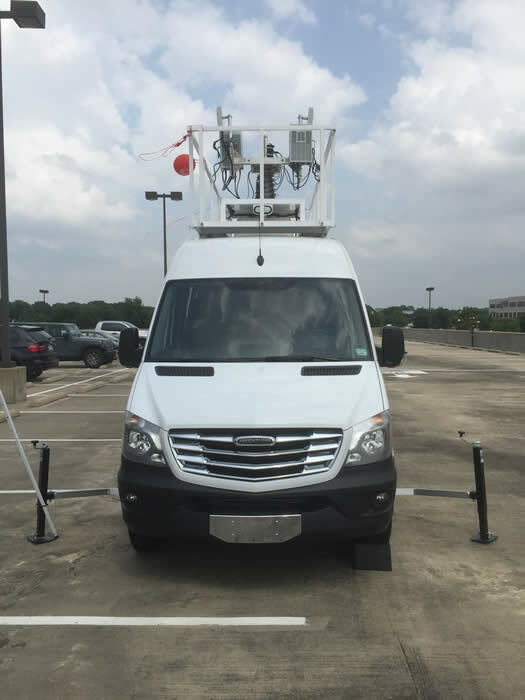 For most of these van applications, the non-locking masts are used, which range in height from 25' up to 56', with payload capacities between 100 - 300 lbs. 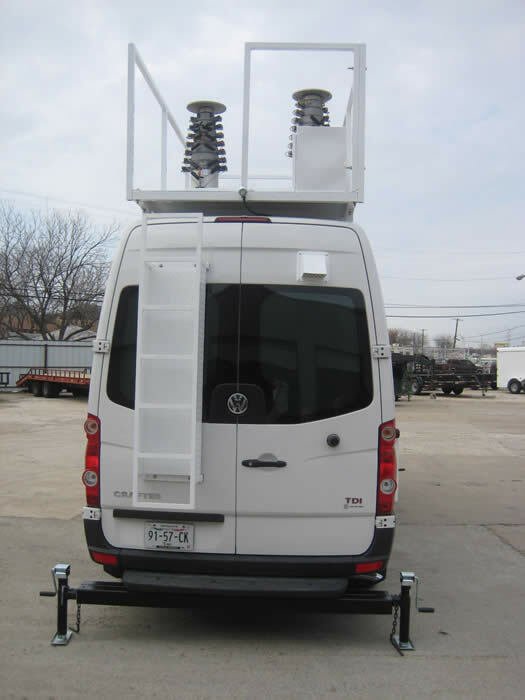 However, the locking masts can also be used, as you will see in the third set of van photos below, we installed both of the 60' locking model masts into the same van (300 lb and 530 lb payload capacities). 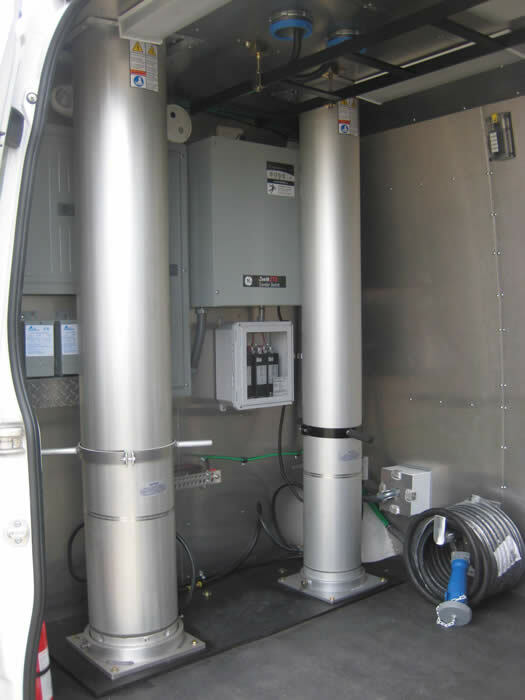 In addition, we recommend that in most of these applications that a 3/4 ton or 1 ton cargo van is used, in order to properly support the payload. 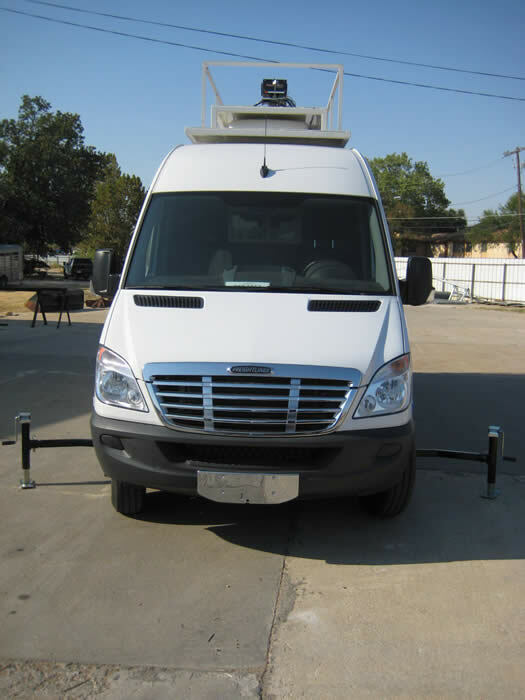 In addition, the required length of the van really depends on the application. 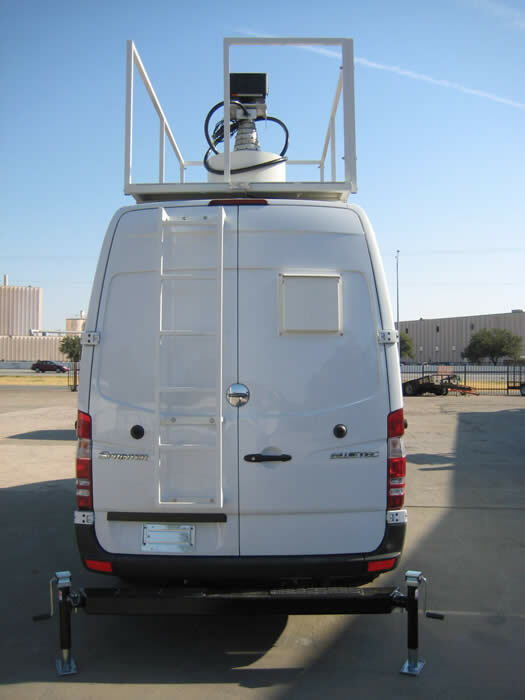 We can recommend which cargo van should be used for any specific application. 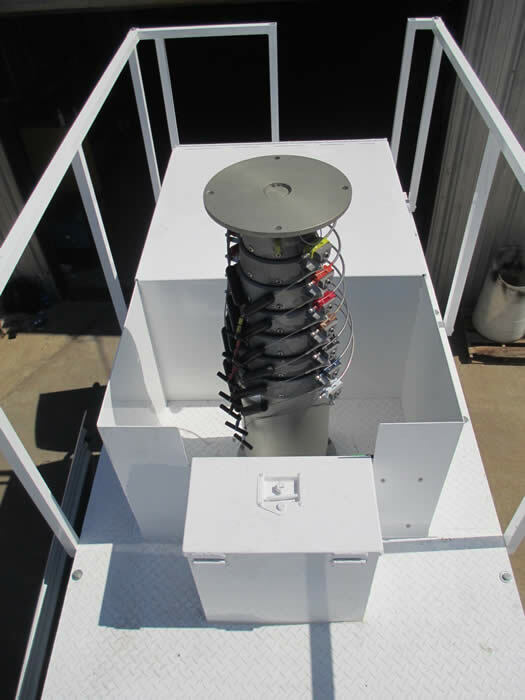 Our standard warranty on all fabrication work, as well as all integration work is 1 year and all other OEM material is warranted by the original manufacturers. 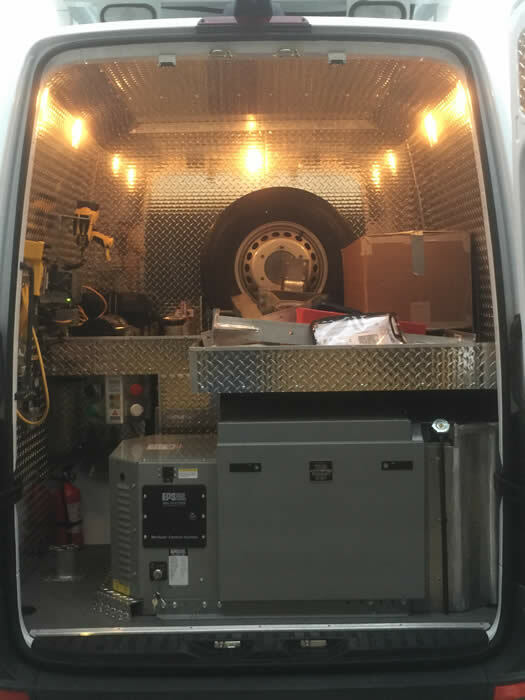 This first set of van photos below shows our CSVAN product built on a Mercedes-Benz Sprinter 3500 (1 ton) cargo van with (1) 60' locking mast, 530 lb payload, a 20 KW EPS single phase generator, 120/240V, 60 Hz equipped with an 80 gallon fuel tank inside the rear compartment, along with the air compressor, which includes a hand held remote and solenoid so that the masts can be operated with it from the top of the van. 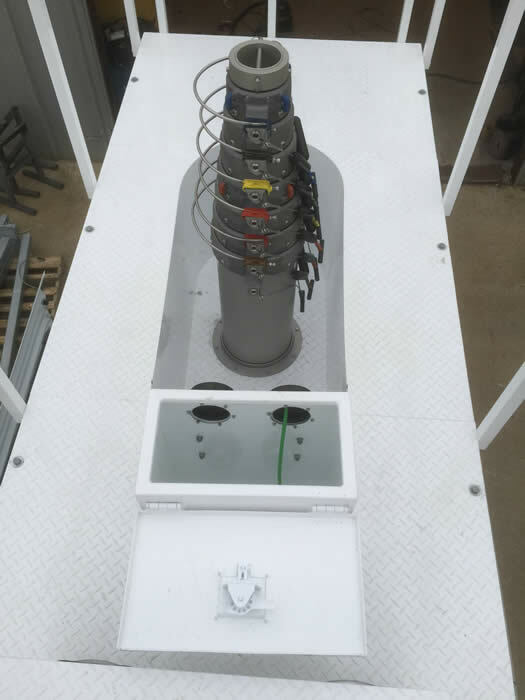 The chassis is equipped with front stabilizer extension arms with jacks and the standard rear bumper is replaced with a set of extendable outrigger tubes with jacks. 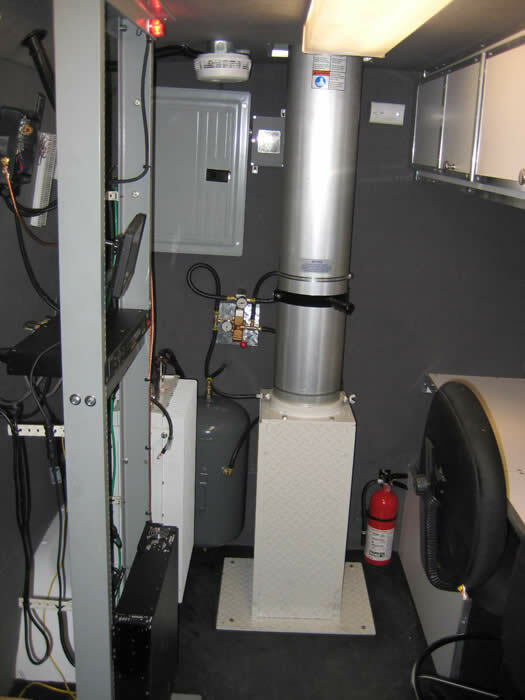 This van also includes a Hubbell 100A utility shore connection in the rear compartment with a 50' power cord, a manual transfer switch, and a 120/240V breaker panel to power TSS and customer equipment. 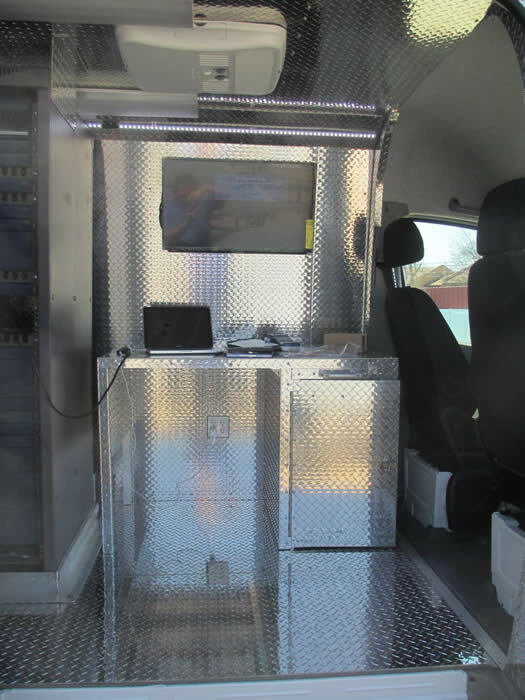 The inside of this van is equipped with the customer's equipment rack (with equipment), custom work station and television, all installed by TSS. 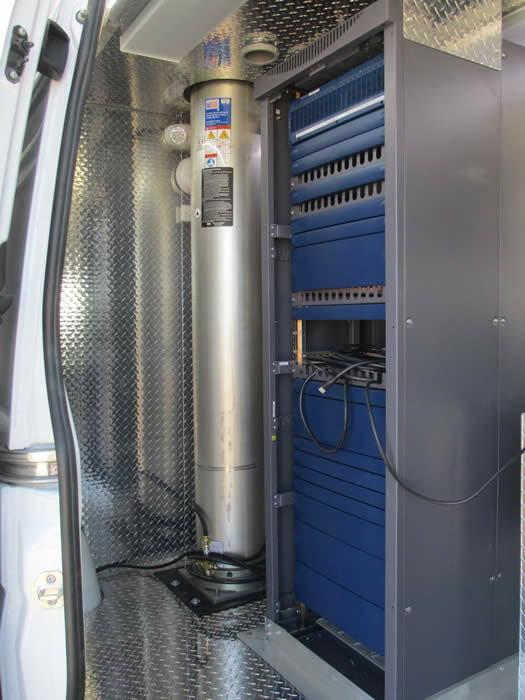 This second set of van photos below shows our CSVAN product built on a Mercedes-Benz Sprinter 3500 (1 ton) cargo van with (1) 60' locking mast, 300 lb payload, a 20 KW EPS single phase generator, 120/240V, 60 Hz equipped with an 80 gallon fuel tank inside the rear compartment, along with the air compressor, which includes a hand held remote and solenoid so that the masts can be operated with it from the top of the van. 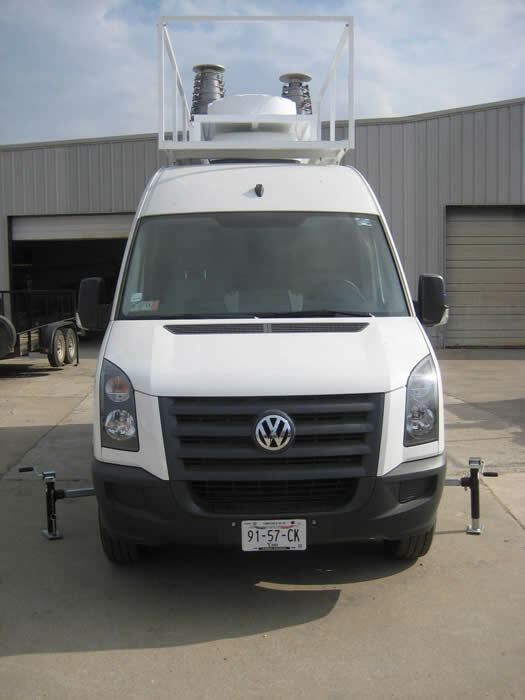 The chassis is equipped with front stabilizer extension arms with jacks and the standard rear bumper is replaced with a set of extendable outrigger tubes with jacks. 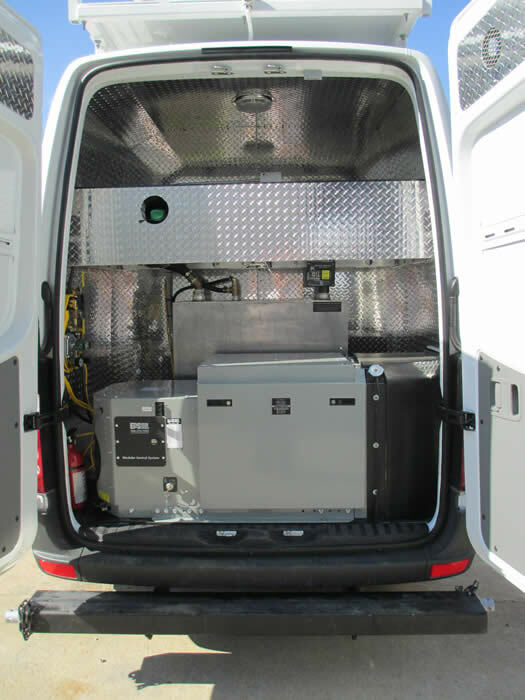 This van also includes a Cam-Lok 100A utility shore connection in the rear compartment with a 50' power cord, an automatic transfer switch, and a 120/240V breaker panel to power TSS and customer equipment. 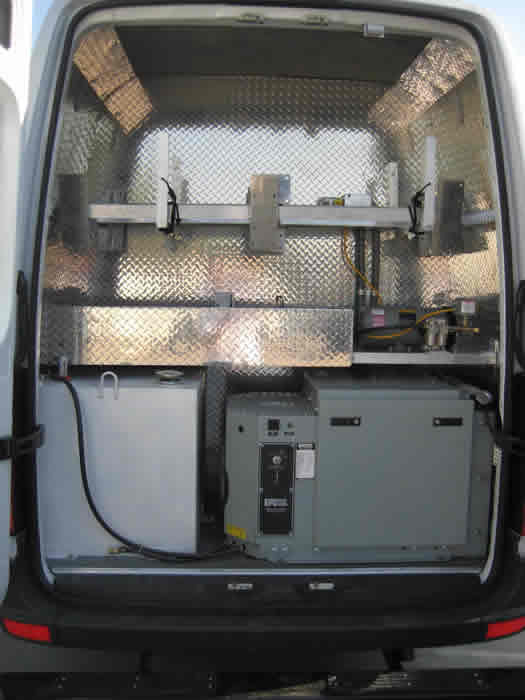 The inside of this van is equipped with (2) 23" 2-post racks for customer installed equipment. 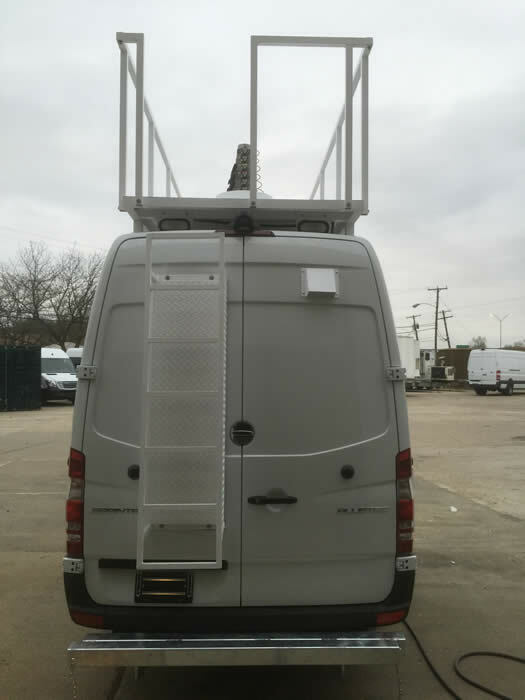 This third set of van photos below shows our CSVAN product built on a Mercedes-Benz Sprinter 3500 cargo van and a Volkswagon Crafter cargo van (very similar), with (2) 60' locking masts, one with a 300 lb payload and one with a 530 lb payload, a 20 KW EPS 3 phase generator, 127/220V, 60 Hz equipped with a 60 gallon fuel tank inside the rear compartment, along with the air compressor, which includes a hand held remote and solenoid so that the masts can be operated with it from the top of the van. 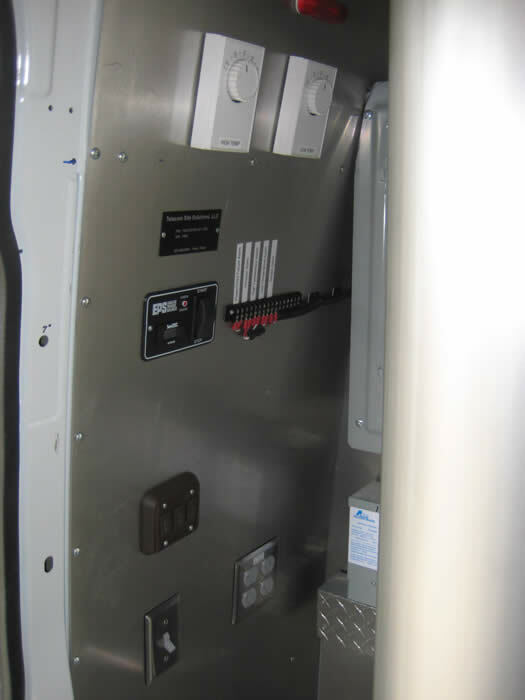 It also includes a utility shore connection with a 50' power cord, an automatic transfer switch, and both a 127/220V 3 phase breaker panel for the customer, as well as a 115V 3 phase breaker panel to power our equipment we provided. 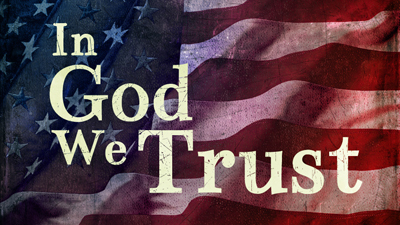 These products are equipped identically, as the only difference is the actual vehicle. 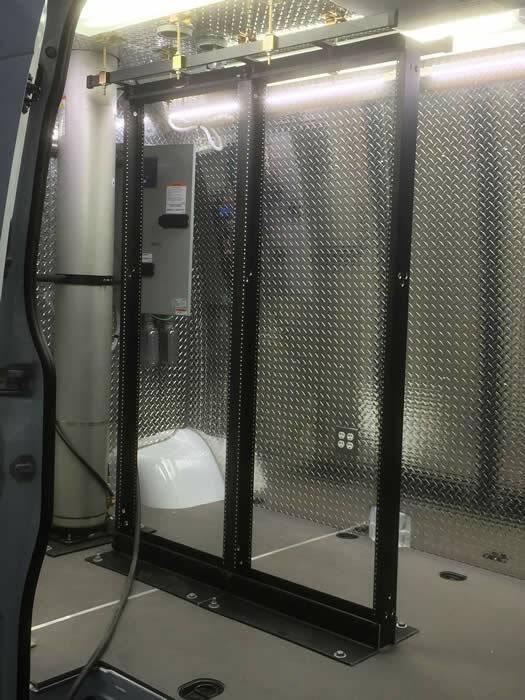 The first (7) photos below show our CSVAN product built on the M-B Sprinter van, and the rest of the photos below that show our CSVAN product on the VW Crafter van. 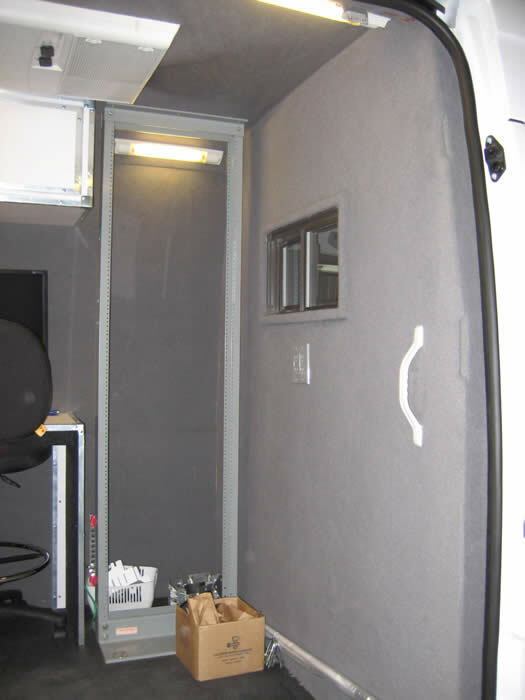 Below are (8) inside photos, showing equippage for both of our CSVAN products shown above, in the M-B Sprinter van as well as the VW Crafter van. 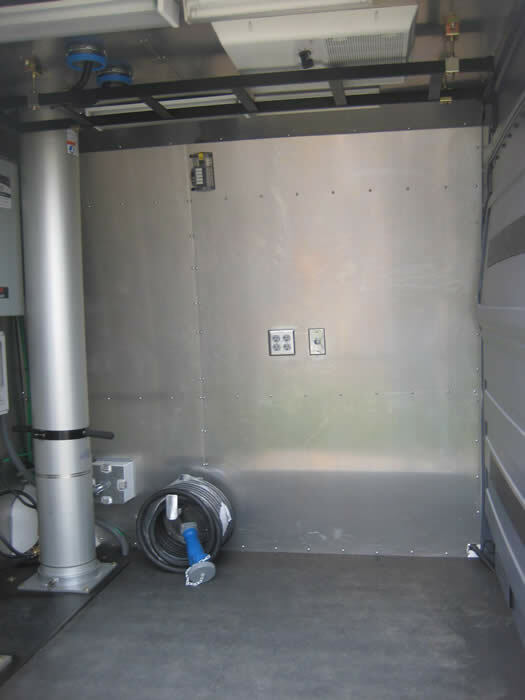 This fourth set of van photos shows our CSVAN product built onto a 1 ton Mercedes Benz Freightliner van with (1) 42' non-locking pneumatic mast, (1) Nycoil basket with 1" ID Nycoil, (1) roof mount air conditioner, (2) equipment racks and (3) work stations inside the main compartment, a separate rear compartment equipped with a 9 KW EPS generator, 50 gallon diesel tank, shelf supporting the air compressor and accessories, as well as a rack for storing the antenna kits. The side view photos below show the vans without the top safety rails installed. 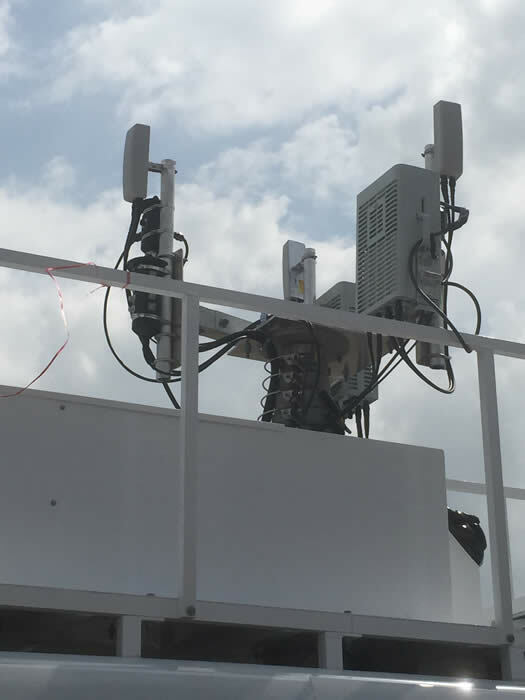 The mast was also equipped with a Will-Burt MW positioner which allows for full pan and tilt, as well as 360 degree rotation.